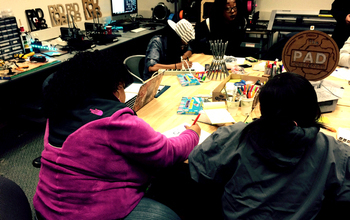 Students in the University of Maryland, Baltimore County’s 3-D printing class collaborating on 3-D designs. Image credit: Erin Buehler, University of Maryland, Baltimore County. 3D printing is often lauded for its ability to create assistive technologies for those who are differently-abled. The “Iron Man” arm, created by Albert Manero and his team from the University of Central Florida for a young boy in Florida, is in many ways an icon for the movement and its transformative potential. But when Amy Hurst, an assistant professor in the Information Systems Department at the University of Maryland, Baltimore County (UMBC), went looking for evidence of a groundswell of people using computer-aided design and 3-D printing to create assistive technologies, she came up short. In 2015, she and her collaborators published the results of a study of Thingiverse, one of the most popular online repositories of 3-D designs for the maker community. She found that less than 1 percent, or 350 of the designs on the site, were for assistive technologies. Her team interviewed 70 individuals who created these designs and found that only 13 of the makers were designing objects for themselves. “No one else was reflectively studying what’s happening in the Maker space,” Hurst said. Hurst found other worrying facts, too. It is well known in the accessibility literature that assistive technologies have a low adoption rate. For example, almost one third of assistive technologies go unused, because they don’t actually meet people’s needs. But Hurst remained convinced DIY and Maker tools offered unmatched opportunities for those with special needs, and wrote a paper for the ACM SIGACCESS Conference on Computers and Accessibility (ASSETS) 2011 conference explaining these opportunities. To test her theories on how individuals use technology, Hurst and her Ph.D. student Erin Buehler studied opportunities for 3-D printing in special education, writing an ASSETS 2014 paper on their findings. They discovered that while instructors and administrators were excited about the potential of the technology, implementing it into everyday use proved difficult. They even gave a 3-D printer to a school with unlimited supplies and technical support–but no explicit requirements on how it should be used–and found the printer was underutilized. For many people, designing on a computer, as opposed to with a pen and paper or lump of clay, is a skill that doesn’t come naturally. Even SketchUp, a simplified platform for creating shapes, takes many hours of practice and learning to master. And when people Hurst studied did acquire those computer skills, most didn’t want to design completely original objects from scratch. Rather, they wanted to alter, repair or create personalized versions of things they already owned. Hurst came to the conclusion that there was a major mismatch between the Making tools available to the public and the ability of those who could most benefit from these technologies to use them. She set out to test other ways of enabling 3-D printing and design that might be more broadly applicable. After more than five years of work, the tools Hurst’s team created are allowing individuals of all skill levels to make objects that are useful to them. Designers interacting with the Easy Make Oven to 3-D print a custom wrench. Image credit: Patrick Carrington, University of Maryland, Baltimore County. The Easy Make Oven–a play on the vintage Easy-Bake Oven toy–was one of several early platforms that Hurst’s lab developed to empower diverse individuals to engage in making. She collaborated on this project with Ph.D. student Patrick Carrington (UMBC) and Shaun Kane (faculty at University of Boulder, Colorado). Rather than use complex 3-D modeling software, the Easy Make Oven employs infrared cameras and projectors to give operators the ability to manipulate and change an object tangibly, by shaping it with their hands. For instance, someone could create a custom wrench by taking an existing one and squeezing the tool’s opening until it’s the proper size to fit a specific bolt. The resulting design could then be exported to a 3-D printer and rapidly prototyped. GripFab is a specialized piece of modeling software, created by Hurst’s students, that takes some of the insights from the Easy Make Oven and applies them to the creation of 3-D-printable assistive hand grips. The tool has an interesting history. Hurst and Buehler were working with staff at Kennedy Krieger High School in Baltimore, Md., in 2013 when they received an unusual request from the school’s therapist. A student with limited hand dexterity at the school wanted to use a stylus for her iPad. She had tried everything on the market, but none fit her hand. Hurst’s team had installed a 3-D printer at the school and the therapist asked if they could use it to design a custom stylus for the student. This set the researchers to work designing a tool that could intuitively accomplish this task. This was great–until the student wanted a grip for her paintbrush, too. “We realized there was an opportunity to create a tool where the therapist can enter in dimensions for attachments and still use the basis for customized assistive grips,” Hurst explained. Ultimately, working closely with therapists, clinicians and end-users, they hope to build up a set of five to 10 styles of grip that will be generalizable and easy to print at home or at community Makerspaces. The team demonstrated the GripFab software at the National Maker Faire in Washington, D.C. in June and recently received an award from the NSF and CRA-W Collaborative Research Experience for Undergraduates (CREU) to continue developing and evaluating the software. Can students with vision impairments be helped by 3-D printing technologies, too? Hurst believes so. Example of a 3-D model automatically generated by VizTouch, and corresponding 3-D printed tactile graphic. Image credit: Amy Hurst, University of Maryland, Baltimore County. She noted that in most math classrooms, students with vision impairments miss out on an important aspect of the instruction–the charts, graphs and equations that teachers write on chalkboards or show via projector. For these students–and for students who are simply tactile learners–Hurst and her team created a tool called VizTouch that lets teachers create 3-D printable tactile graphics through a simple computer interface. Teachers enter an equation, or data from a spreadsheet, and VizTouch generates a file in less than a minute that can be 3-D printed in about an hour and given to students to let them feel the concepts being explained. For a lesson on economics, for instance, the instructor can print and hand a tactile graphic to a visually impaired student so they can understand the peaks and valleys of market fluctuations. So far, the researchers have prototyped the tool and evaluated the designs with users. They presented the research at the ACM International conference on Tangible, Embedded and Embodied Interaction (TEI) in 2012 and have worked with the Maryland School for the Blind on the development of this prototype. Example of 3-D prints and models from the UMBC 3-D printing class: A) artifacts designed and fabricated by students including key chains, statues and cookie cutters; B) 3-D model of a basketball court made by a student with an Intellectual Disability; C) set of 100 3-D printed rings produced for a client. Image credit: William Easley, University of Maryland, Baltimore County. Even when Making is not serving as a means to create assistive technologies, it can still be a boon to individuals with special needs. Through a unique program at UMBC, Marylanders with intellectual disabilities, like autism or the Down syndrome, are able to participate in classes and internships alongside their peers at the four-year college. The program, Students United for Campus-Community Engagement for Post-Secondary Success (SUCCESS), is in its fourth year and is one of the few non-degree program in the nation that focuses on preparing students for employment and independent living. With support from the National Science Foundation, Hurst and Buehler were able to launch a Makerspace as part of the SUCCESS program and offered their first class on 3-D printing in spring 2015. Students learn to design 3-D objects using computer-aided design tools and master 3-D printing. In the process, they develop a new sense of themselves as individuals with the tools and knowledge to create objects of their own design. “These are individuals who many people would discount and overlook and not think of as Makers, and we were getting them to do 3-D printing just like engineering students,” Hurst said. As the Maker movement gains steam, giving all Americans access to Making tools and the knowledge to use them is crucial, Hurst said. She and her collaborators are trying to make sure that happens. “We’re empowering people to incorporate making into their daily lives to solve their own accessibility challenges,” Hurst said. Working with a diverse population including individuals with intellectual disabilities, power wheelchair users, individuals with visual impairments, and physical therapists, she is demonstrating what can happen when technology intersects with opportunity.